This book by Kevin Conner undertakes to interpret signs, symbols, and types that he discovers beneath the surface in biblical text. - Publisher The language of divine origin, which God has woven throughout the Bible, contains characteristics and shades of meaning that would be lost to the believer if he did not acquaint himself with the needed terminology. In this easy-to-use reference guide, Kevin Conner clearly presents the richness of scriptural truth to assist Christians in understanding the use of signs and symbols in God's Word. 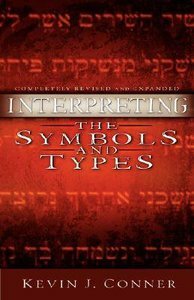 About "Interpreting the Symbols and Types"
The language of divine origin, which God has woven throughout the Bible, contains characteristics and shades of meaning that would be lost to the believer if he did not acquaint himself with the needed terminology. In this easy-to-use reference guide, Kevin Conner clearly presents the richness of scriptural truth to assist Christians in understanding the use of signs and symbols in God's Word.